TO LEARN MORE ABOUT THAT REPORT. Once assessment data enters the system, aimswebPlus enables immediate reporting for assessments. Teachers will be able to unlock and launch assessments from the Assess column. Each column provides specific information on the composite and individual measures, accessible by clicking on the colored bars. By default, students most at risk are listed at the top. 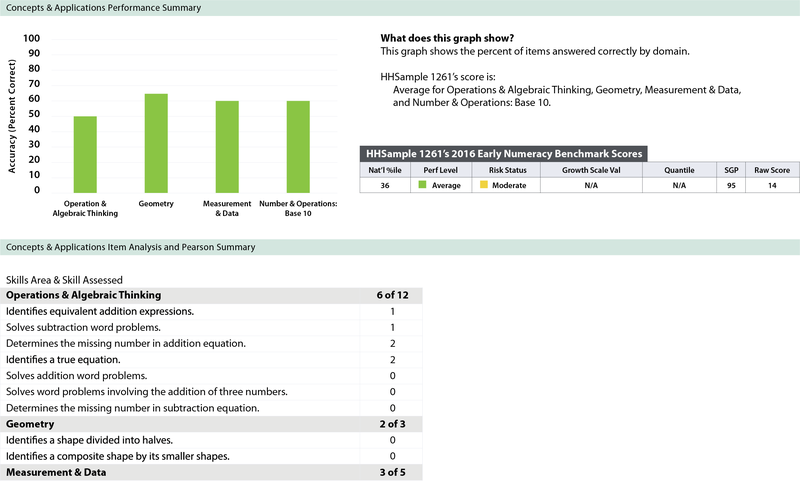 The Benchmark Comparison page displays students’ composite scores as the color-coded bar lines. Teachers can immediately see students’ progress toward progress monitoring goals, for students whose schedule has been set up, via the goal bar lines. This report shows the student's progress toward an instructional goal set by the teacher. It displays the goal score, number of errors, a line connecting the baseline score to the goal score (the aimline), the weekly progress monitoring scores, and a best-fitting linear regression line (the trendline) projected out to the goal date. The green bar represents the goal and the student's progress toward that goal. 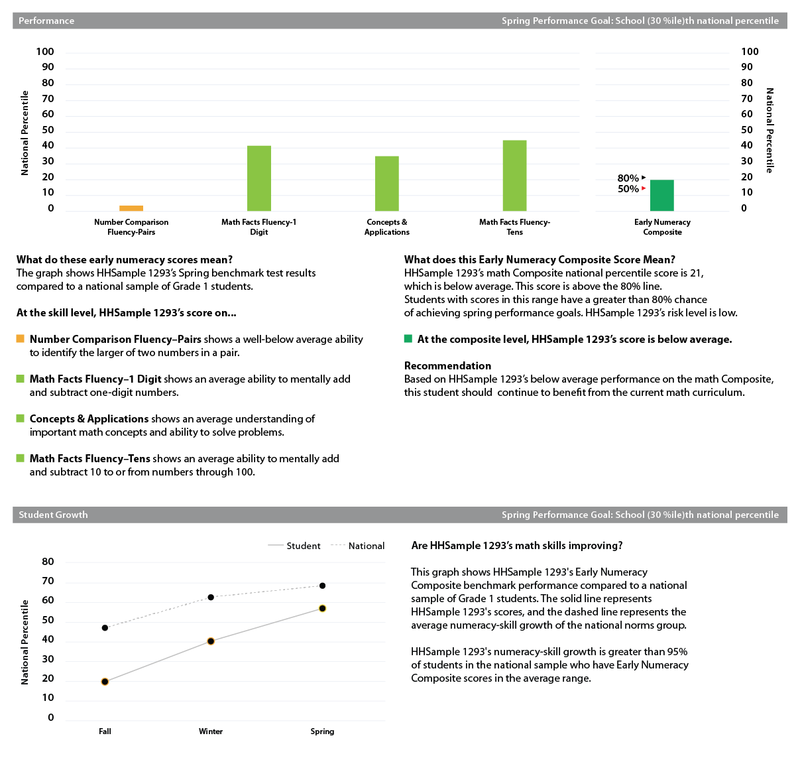 This view lists individual scores and the rate of improvement (updated with each new score), the Goal Statement, and other graphical elements indicating when an intervention or goal change was made. This report allows teachers to see at-a-glance student performance by individual measure as well as the composite. It's often shared to communicate student performance during parent/teacher conferences. A brief narrative displays performance by measure and recommends the intensity of instructional need. 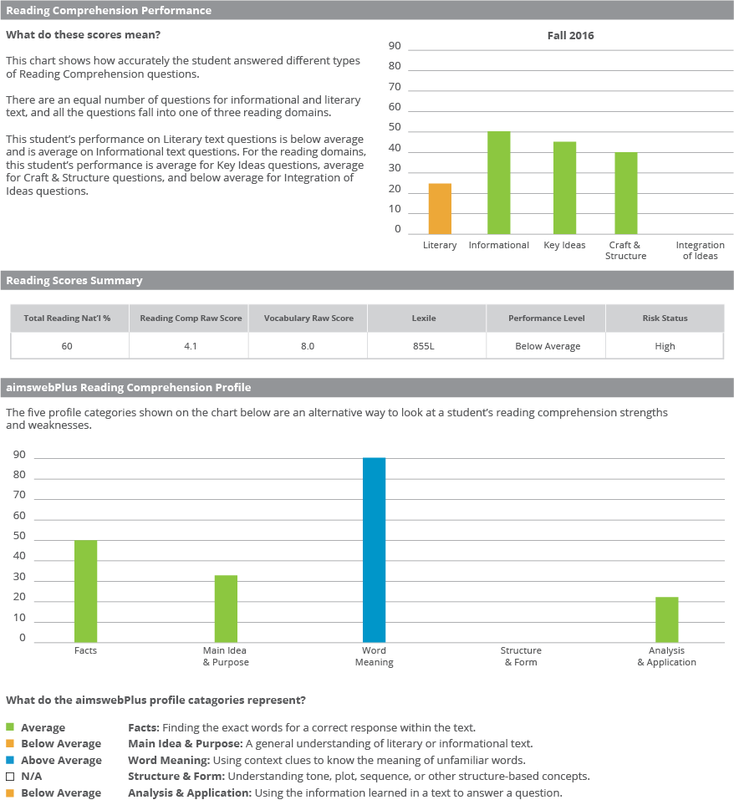 This report provides further analysis of the student's math performance, showing how the student performed in each of the major math domains. The report also shows item-level performance, organized by math domain, and provides a brief description of the behavioral objective for each item. Teachers can use this table to identify very specific skills that need further instruction. A score summary table provides the student’s national percentile, performance level, Quantile, and Growth Scale Value (vertical scale score) on the Concepts & Applications measure. 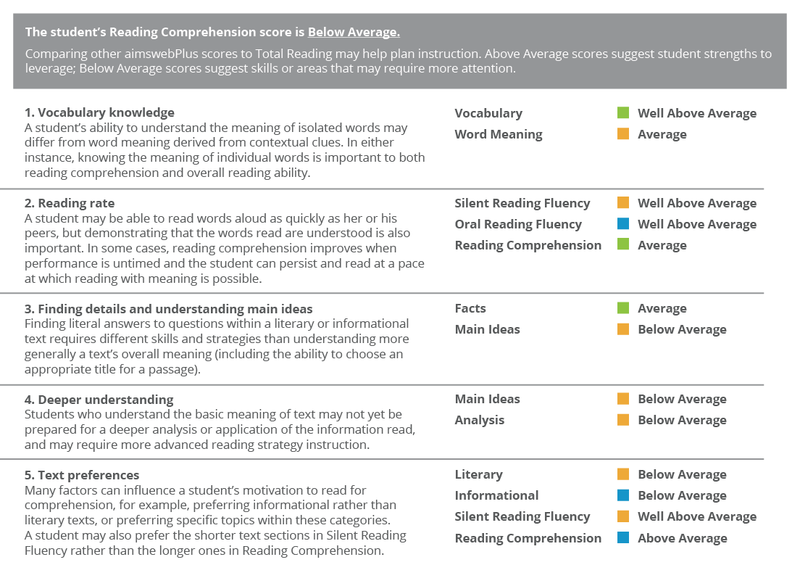 This report provides further analysis of the student's reading performance in four sections: Reading Comprehension domain and passage type, Reading Scores Summary, Reading Comprehension question type, and Reading Comprehension score insights. It gives actionable information on the complex process of reading comprehension. 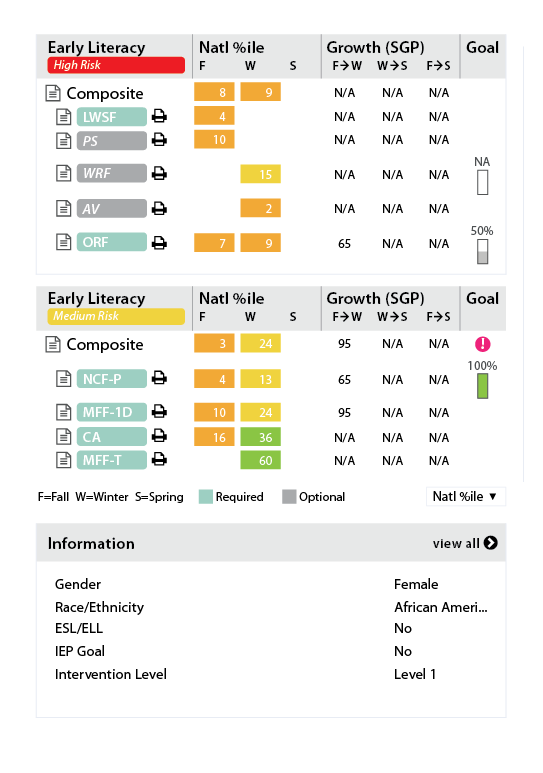 This dashboard of individual student information allows teachers to see a holistic view of student performance across measures and periods for the selected school year. The print icon allows teachers to see corrects and incorrects from the student test administration. 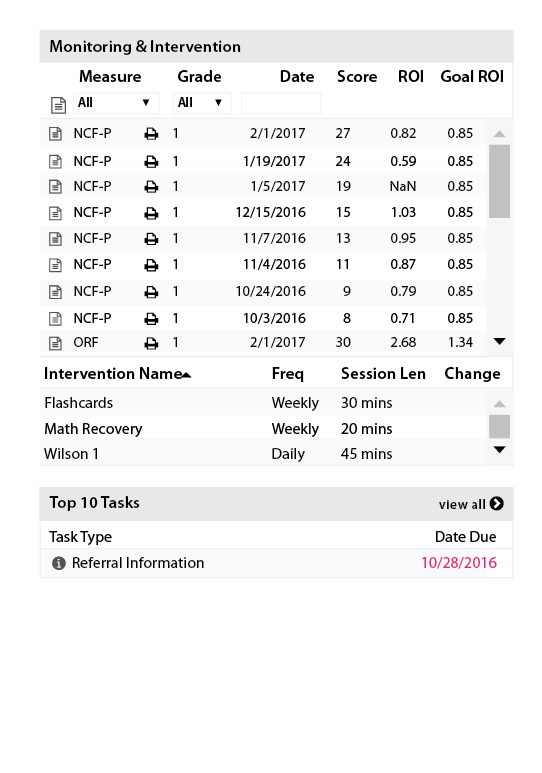 This task pane provides teachers and interventionists a place to document meetings regarding a student’s instructional plan, and a place to upload additional information such as IEP meeting notes, student work samples, or other assessment data. aimsweb™Plus helps districts like yours advance their use of educational technology through its online progress monitoring, benchmarking, data management, and reporting system for grades K-8. As an all-in-one system that supports multi-tiered instructional models, it's designed to support multi-tiered instructional models and universally screen and progress monitor using brief, valid, and reliable curriculum- and standards-based measures of foundational skills in reading and math. By measuring the success of campus curriculum choices and teachers' instructional strategies, aimswebPlus empowers teachers to effectively and efficiently map instruction to the individual student need. They can identify students at risk of academic failure through traffic-light-style reporting, which serves as a tool that measures, monitors and documents the impact of early intervention efforts. If you’re looking for an insightful benchmark assessment, frequent progress monitoring, and clear reporting, learn more about aimswebPlus. To learn more about aimswebPlus, including pricing or ordering information, complete this form. Printed reports may be in a different format. This view shows the on-screen reports. Copyright ©2019 Pearson Education. All Rights Reserved.